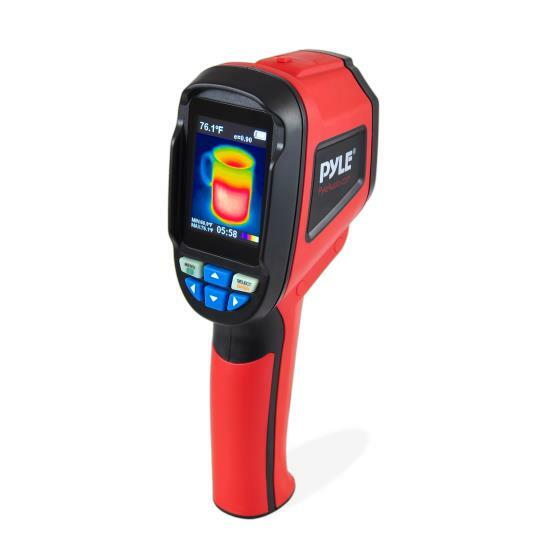 The Pyle Handheld Thermal Imaging Camera provides instant, accurate and reliable heat signatures. The digital infrared sensor captures temperature ranges from -4°F to 572°F, (-20°C ~ +300°C). The 2.4'' digital display screen provides HD color output readings with (4) selectable color palette readouts; high contrast, iron red, rainbow and gray scale signatures. The convenient handheld design features simple 'point & shoot' activation with trigger button -- which makes the system perfect for on-site applications. Use the thermal imaging camera for maintenance & repairs, insulation barrier inspection, energy efficiency monitoring and device troubleshooting. Additional system features include Micro SD memory card slot for easy file saving and transfer to computer, digital LCD display for heat signature previews with the ability to delete unwanted images using the integrated button controls. Enjoy versatile digital heat sensing ability with the Pyle PTIMGCM83 Infrared IR Thermal Imaging Camera.